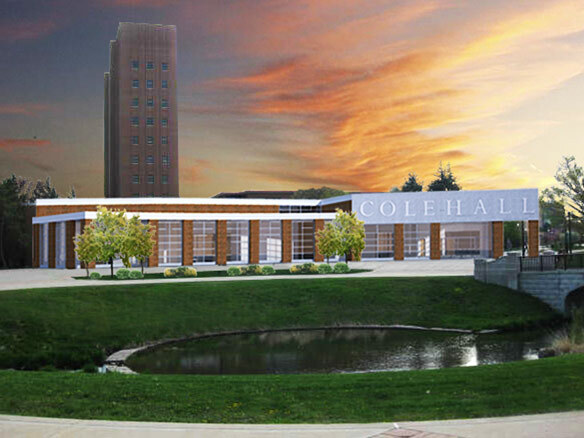 DeKalb, Ill. - Northern Illinois University today unveiled plans for a remodeled Cole Hall. When work is completed the building will include a state-of-the-art lecture hall, a new home for the NIU Anthropology Museum and a computer laboratory designed to cultivate collaborative problem solving skills. Work on the project is to begin immediately and the building is expected to be reopened in the fall of 2011. The 15,000-square-foot building previously housed two 400-seat lecture halls. One of those halls was the site of the Feb. 14, 2008 tragedy that saw a gunman kill five students and wound 19 others. The building, which was the largest lecture facility on campus, has been closed since the shootings. That created severe logistical problems for the university as it scrambled to relocate classes while administrators considered the best way to use the facility going forward. One of the greatest challenges was finding a way to bring badly needed lecture space back online while accommodating the widely held opinion that the site of the shootings never again be utilized as classroom space. “I believe that this is an elegant solution, one that accommodates several academic needs while honoring the wishes of the campus community,” said NIU President John Peters. “It is respectful to the memories of our slain students while creating new and innovative spaces where students will learn for generations to come.” The building will be remodeled to accommodate three primary uses. A significant portion of the southeast auditorium, where the shooting took place, will become home to the NIU Anthropology Museum. The museum is presently located in converted classroom space in the neighboring Stevens Building. That building is slated for major remodeling work in the near future, which would have necessitated temporarily closing or relocating the museum. The high ceilings and uninterrupted floor space available in Cole Hall will provide for greater flexibility in the creation of displays and more dramatic lighting. The new facility also will have modern temperature and humidity controls (essential to preserving museum artifacts) that are sorely lacking in the current museum. The museum owns more than 150,000 osteological, archaeological and ethnographic specimens. Some of its stronger collections focus on Southeast Asia, New Guinea and the plains and southwest regions of North America. Currently, items that are not on display are stored in the basement of Cole Hall. In addition to providing a place for the display of those artifacts, the museum is used to provide learning opportunities for students enrolled in NIU’s certificate program in museum studies. That program, which is the only one of its kind offered in the northern Illinois region, prepares students for careers working in museums, teaching them how to preserve, research, interpret and exhibit artifacts. The remainder of the former auditorium will house a 21st century student learning studio/computer laboratory that will encourage students to solve problems collaboratively while taking advantage of online resources. The facility, which will accommodate up to 50 students at one time, will be based on the SCALE-UP (Student Centered Active Learning Environment for Undergraduate Programs) model pioneered at North Carolina State University, and used at more than 50 universities nationwide. The lab will provide a technology-rich atmosphere for team-based problem solving. Classes will consist of students broken down into teams seated around tables with access to computers for research and whiteboards for capturing and sharing information and ideas. At the start of a session teams will be presented with interesting questions to ponder, problems to solve or hands-on simulation exercises to complete. Students will work collaboratively to find answers, with the instructor providing prompts, comparing and contrasting the actions of different teams and guiding the teams to solutions. Other schools have used similar facilities in classes such as physics, chemistry, math, biology, engineering and even literature. Results to date indicate that students gain a better conceptual understanding of the subject matter than their peers in traditional lecture-based classes. This remaining auditorium is to be revitalized and put back into service to again function as a large, 300 – 400-seat lecture hall, but with modern standards for seating, space allotments, ADA compliance, and smart classroom technology. Staggered decking may be installed on the sloped floor to accommodate desk-and-chair style rows or seats with tablet arms, and the possibility of flexible swivel seating style arrangements that make it easier for students to work in small groups. The auditorium space lost during the remodeling process will be replaced by a new lecture hall to be constructed as part of the remodeling of the Stevens Building. The university has approached improvements at Cole and Stevens in a comprehensive manner, coordinating work on the neighboring buildings. Money for work on both buildings was included in the capital spending appropriation last July and Gov. Pat Quinn released $10.3 million to address the needs of both buildings this past January. The 50-year-old Cole Hall will receive a number of improvements, including a new fire alarm and sprinkler system, replacement of antiquated heating, ventilation and air conditioning systems and updated mechanical, electrical and plumbing systems. The lobby and building façade also will dramatically change so that the face of Cole Hall is completely different. These areas will be reconstructed in a completely different configuration to enhance egress, comply with ADA regulations and change the image of Cole Hall. Extensive glazing, new doors and hardware, and interior finishes will create a new interior that will be modern, attractive, and upbeat. The exterior façade could include a canopy structure. Planning for the improvements will commence at once, with actual construction expected to begin by November or December. The goal is to have the building back online when students return for classes in the fall of 2011. Read the article on the NIU site here.